Am I still considered a Christian if I haven’t been baptized? Q. I grew up in a country that is not predominantly Christian, but I decided as a young adult that I wanted to be a Christian and I prayed a “salvation prayer.” I feel blessed that many fellow Christians came into my life to offer support and spiritual guidance after that. I identify my religion as Christianity. But I do not go to church regularly, because for many reasons I haven’t found the right church yet, and I have not been baptized. Most churches require you to be member before you can be baptized. Some allow baptism if you pay a fee and take a course for a month, but that doesn’t feel right to me. I would love to study the Bible and know more in depth about it, and I would like to find a church and attend services regularly. Most of all, I would like to be baptized. But what if I never find the right church where that can happen? Am I still considered a Christian if I haven’t been baptized? This issue concerns me quite a bit and I would like to hear your advice. Thank you! 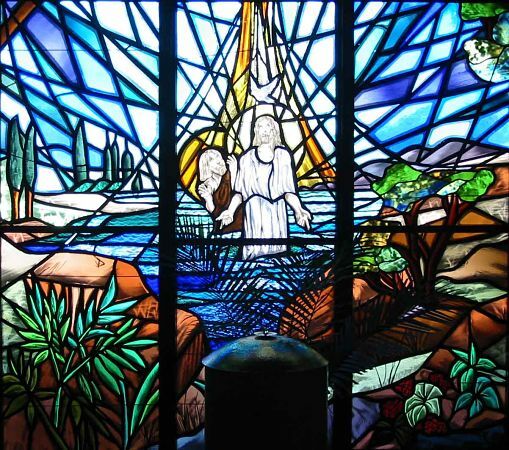 A stained glass window in St. John the Evangelist Church of Carmichael, California depicting Jesus being baptized. A person becomes a Christian by choosing to follow Jesus as their Lord and Savior, trusting in His death on the cross as completely sufficient for their forgiveness and reconciliation to God. Nothing needs to be added to the “finished work of Christ” (as it’s called) for a person’s salvation, and indeed nothing can be added to it. So the simple answer to your question is that a person does not need to be baptized, in addition to trusting in Christ, in order to be a genuine Christian. Why, then, did Peter tell the crowds who gathered to hear the gospel on the day of Pentecost, “Repent and be baptized in the name of Jesus Christ for the forgiveness of your sins”? Doesn’t this suggest that repentance (confessing wrong and asking forgiveness) isn’t enough, and that a person really does need to be baptized in order to become a Christian? No, such an interpretation is not consistent with the New Testament teaching that salvation is by God’s grace alone, received through faith, and not dependent on anything we might do in addition. So I think we should understand instead that while baptism is not necessary for salvation, it is necessary for repentance. That’s what “repent and be baptized for the forgiveness of your sins” actually signifies. Specifically, when we are baptized, we are demonstrating our repentance (our sorrow over the things we have done that have separated us from God) in the way that Jesus has asked us to do this. Put another way, we are coming to God on His terms, not on our own. This is consistent with the idea that our salvation is completely the work of God, not our own work. So I think that if you want to honor and obey Jesus as your Lord and Savior, you should be baptized as He has asked, as a sign to Him, to yourself, and to others that, as you say, you identify yourself as a Christian. But this means that you will need to find a church community that can baptize you. Believers can’t baptize themselves; rather, churches are given the solemn responsibility before God of ensuring that, at least so far as they can determine, the people they baptize have genuinely trusted in Jesus and understand the meaning and significance of baptism. That’s why churches generally want you to be a “member” (that is, a regular attendee whom they’ve gotten to know) or at least take a course about baptism before they will baptize you. I would encourage you to believe that precisely because God has asked you to express your identification as a Christian through baptism, God will help you obey His command by enabling you to find a church where you can be baptized. The process may actually begin with you meeting a pastor who will recognize your faith and agree to baptize you on the basis of that faith, with the understanding that you want to grow as a follower of Jesus and become a regular part of a community of His other followers. I believe you can pray confidently and boldly for God to lead you to such a church and to such a pastor. God will help you do what He has asked you to do! This is one more way in which our salvation is entirely the work of God on our behalf. Best wishes and God’s blessings to you. How many people did Jesus baptize? And Paul? According to the Gospel of John, Jesus’ disciples baptized “more followers” than even John the Baptist, but “Jesus himself did not baptize anyone.” As for Paul, he seems to have baptized people on some occasions, but he didn’t do this generally; rather, as he explained to the Corinthians, he believed that “Christ did not send me to baptize, but to preach the gospel.” This comment is somewhat ironic since when Jesus, after his resurrection, sent the disciples out to “preach the gospel to all creation,” he told them to baptize those who believed the gospel. But the examples of Jesus and Paul suggest we should not keep track of how may people a given pastor or evangelist has baptized, as if they were some kind of trophy. Previous Previous post: Will our pets be in Heaven with us?